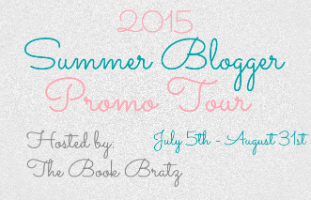 The 2015 Summer Blogger Promo Tour is hosted by Amber and Jessica at The Book Bratz, and it's a fun tour where book bloggers collaborate with other book bloggers, become besties, and introduce one another on each of our blogs. The added benefit is if you've gotten bored of me, you get to meet some awesome people you may not have been introduced to before! Or should I saw re-meeting...everyone! It seems not too long ago that we started this Sunday special called the Summer Blogger Promo Tour, and finally, we've come to the very last stop of the tour. When I first started, I thought it'd be uncomfortable talking to new bloggers and coming up ways to introduce ourselves on other blogs. However, it soon became apparent that book bloggers are just such nice people in general and what might have been a chore ended up being surprisingly fun! Sure, sometimes I almost forgot to write up my post and ended up with fingers rapidly flying across the keyboard a few hours after midnight on the day of the tour stop, but hey, we've all been there. I gained so much from this tour (though clearly not anti-procrastination), and by that I mean I got so many new blogger friends! Without a doubt my favorite part of the tour has been all the new people I've met and been able to present to you all - one of the best parts of being a book blogger is meeting new people, and the SBPT was a great opportunity. Bloggers, I highly recommend you participate in it next year if you haven't already: it's a wonderful experience. For anyone who missed any of the tour stops or would like to go back to some of the posts, below is a summary of the tour schedule plus links to each individual blogger's post! We talked with Amber & Jessica at The Book Bratz (the very hosts of the tour themselves) and discussed crazy weird situations and which books would be most handy at the time. We met Stephanie from Ohana Reads and talked about her blogging career as well as whether or not she sees herself blogging in the future ten years from now. We asked Jessica from Crossroad Reviews what her top ten favorite TV shows are, and got some pretty awesome recommendations along the way. 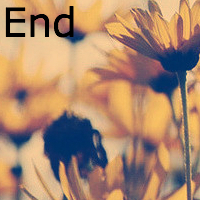 We talked to Kaitlin from Reading Is My Treasure and she shared the three cliffhangers which killed her the most, and also added GIFs that express exactly how she felt during those endings. We pressured Ana from Ana Loves... into choosing a single book boyfriend she'd like to spend eternity with, then got her to ask him seven life-altering questions. We met with Jaclyn from Living In A World Of Book Quotes and not only did she tell us why and when she decided to start sharing book quotes with the world, but also her six favorite quotes and why. We befriended the other Kaitlin from Next Page Please! and discussed her favorite book ever along with her dream cast for the novel if it were to be made into a movie. We met up with none other than Giselle from Book Nerd Canada and she told us what her story would have been if she was a book character. Spoiler: there's a love interest. So what did you guys think of SBPT15? Did it introduce you to some great new bloggers? Would you like to see it again next summer? Are you interested in taking part? Let me know!